Figuring out the A-Z Archive: O challenge was difficult only because I had to choose between so many of my favorite owls! Last month I spent a memorable evening at the Center for Birds of Prey in Charleston, South Carolina, when they devoted an entire night to the owls. It was a photographer’s nirvana, as the staff presented a variety of owl species for viewing and flight demonstrations, and I had ample time to learn more about them as well as capture some wonderful images. 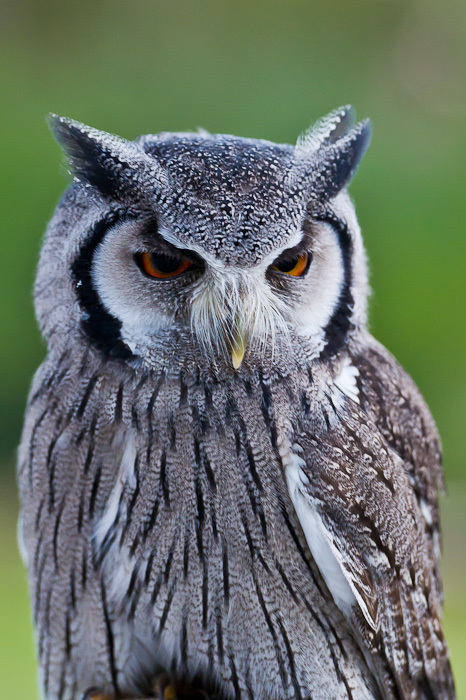 This is the Southern White-Faced Owl, from the family of Strigidae, a native of Southern Africa. His stunning eyes seemed to glow brighter as the evening light diminished. This owl has a unique talent. He’s able to change his appearance dramatically depending on his environment. If challenged, he’s able to puff himself up and appear much larger, while he’s also able to shrivel in size to better hide from danger and mimic a tree branch. Thankfully, he seemed at ease with his admiring fans this evening and confidently posed for the camera, providing me with his lovely face for my “O” archive. fantastic owl portrait! every single feather so clear – and she has stolen our cat’s eyes! You are right, Frizz. It does resemble a cat’s eye! Wow truly a fantastic photo Tricia!!! What an experience this must have been! Do you remember when I had the rescued screeh owl that I named Shyly? What fun it was to share our home with him. This photograph is gorgeous…..if I was still on an owl kick, I would definitely have to purchase a copy! Thank you, Lucinda! You know, I remember your house was full of different species, but I don’t recall the owl. Was that in Maryland? What a great experience that must have been! Fabulous photo! Such detail and clarity. I love it! Thank you so much! It was just an incredible looking bird! sweet shot! I love how his brown eyes pop right out from his monochrome coat. Yes, the owl’s eyes just seemed to glow more and more as the light diminished. It must be so amazing to see these out in the wild, when you’re not really expecting it, suddenly the eyes would pop out of the darkness. No wonder people have called them ghost birds!